Includes front and side door for convenience. Comes with a ABS plastic tray, and split divider for inside the cage. Made out of steel, and has high tensile strength wiring. This cage is very easy to unfold and set up. Dimensions for this cage are: 30x18x20 inches (LxWxH). These BestPet metal crates are made with premium quality materials. They are built to last long, and are even coated with a black finish that prevents rusting and corrosion. They are made out of steel, and has high tensile strength wiring. This cage is very easy to set up. You simply just un box the item, and unfold the crate. Each crate includes a light weight slid out tray that is made from ABS plastic. This tray comes with a lip around the perimeter which helps make it easy to remove and clean if necessary. 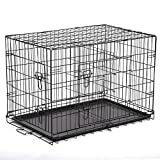 With the rounded edges of the crate your pet is contained in a safe environment. The dimensions for this cage are: 30x18x20 inches (LxWxH). This crate also features multiple doors on the cage to open, and a split divider for inside the cage.